Whilst Glen Eira is content to spend thousands on its notorious ’11 cent flyer’ of misinformation and outright deceit, thankfully other councils are not cut from the same cloth. 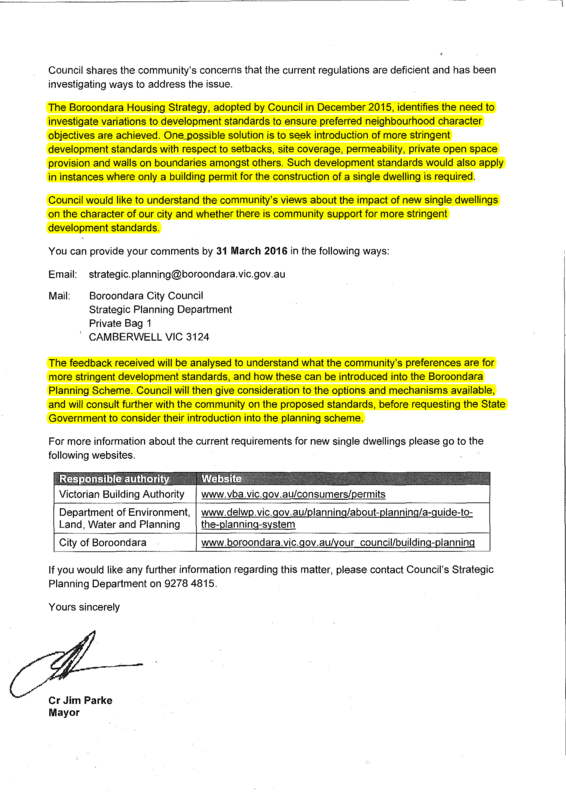 Below is the latest Boroondara effort – a letter sent to all residents regarding planning and asking for initial feedback. Boroondara already has more in its schedules than Glen Eira. Doesn’t stop them from going for more. In Glen Eira all you get is how fantastic the zones are so not a single thing has to change. Not that surprised to see researchers talk supportively on behalf of the institutions that fund them. The article did at least provide some links for further information, which is more than LXRA has managed to do. They lost credibility when they glibly dismissed most problems eg around overlooking, but conceded “negotiated settlements might be needed” for overshadowing. Article ignores that we have a Planning Scheme and residential amenity standards. It does seem they have overstated the alleged benefits. “Quiet streets for safer walking and cycling” is not on the agenda of the development industry. “Opportunities for multi-scale economic and social development around stations” could describe Vancouver Plaza 88. Not even LXRA claims “Melbourne has a legacy of successful elevated rail”. I asked them to cite an example and they declined. Not a good idea for John Stone and Ian Woodcock to characterise people unhappy with the process and inadequate information as having “shrill voices of complaint”. Again I checked with LXRA whether insulting people was something they encouraged. 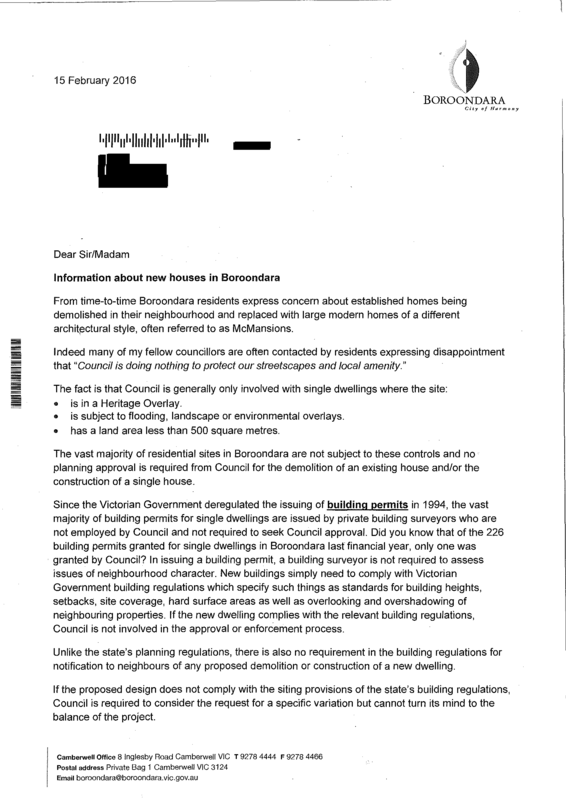 I haven’t seen much evidence that Boroondara audits the work of building surveyors, and I expect they have the same problems as Glen Eira has with surveyors signing off on work that doesn’t comply with Regs or Planning Permits. Glen Eira’s policy is not to insist on compliance, with “near enough” being good enough for them. GECC has attempted to insert conditions in Permits requiring surveyors to sign off at intermediate stages, but VCAT has been known to turf them, arguing despite all the evidence to the contrary about the building industry that they are “unnecessary”. It is true that Boroondara goes to considerable effort to consult residents, but that isn;t sufficient when it makes incongruous decisions. Along Whitehorse Rd, other than immediately fronting the road, it decided on NRZ for one side and GRZ for the other, without a rationale. It chose GRZ for a hill so steep it will be a challenge to build 3 storeys while complying with amenity standards. While not a planning matter, I’m aware that the decision to close the gates to Beckitt Park was not at the request of residents near the Park and was done with no consultation. The officer involved was particularly rude when asked why.